This story is small, compelling gem: three modern day characters hovering around the traces of genius from an artist now gone for nearly 400 years. 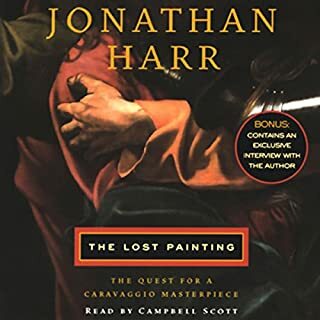 For some reason, this plot did not confuse me: Harr does an effective job of connecting the reader with each of the three main protagonists, and of explaining to me their separate fascinations with Caravaggio's wild brilliance. I felt the web of social relations surrounding each of the three, and the depth of their shared "Caravaggio madness", as a binding force in the book. Harr's prose is well-suited to audio format: clear, crisp, very much to the point. He turns his fascination with technical detail into a strength: the detail takes on a life of its own at times, serving as the medium through which the searchers come into contact with the painting: and through it with Caravaggio himself. This is, after all, a story of a transformative search: one that alters the lives of two of the three main characters, and that reveals the life of the fourth. This is neither an exhaustive assessment of the painting nor a thorough biography of the artist. Instead, it is (in effect) a thoughtful assessment of why we dig into the beauties of the past and on the pleasures and miseries of scholarship, even of obsession. The reader is perfect: great sound, intonation and pace. Altogether a must-read. 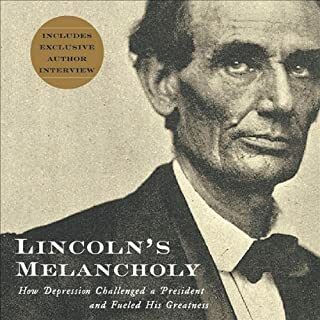 The idea that Lincoln experienced a major mental disorder throughout his life matches my sense of Lincoln as a "man of constant sorrows". The argument that he transformed his mental condition into a source of strength and resilience matches his record of performance. This book provides valuable insights into how this transformation occurred, and into how Lincoln's condition emerged from and was fostered by the culture of his age. The organization is generally chronological, but with frequent tangents into cultural and psychological theory . . . on occasion, I found it hard to figure out where the author was going, but his tangents are usually well presented. He is also very strong in reviewing how different biographers and historians have viewed Lincoln's personality, and how those views have changed over time. The reader is good and clear. My only real negative: the producers put disconnected music in at odd points, often not related to major breaks in the discussion, which interferes with an otherwise good listen.